High 'Revel' mixed fabric types, stretch jersey, short-sleeved, print t-shirt. Round neck with, stretch, knitted, ribbed trim with pinstripe under-trim. Raw, rolled hem and arm holes. Stretch pinstripe insets under the arms. Longer at the rear. Seam details. 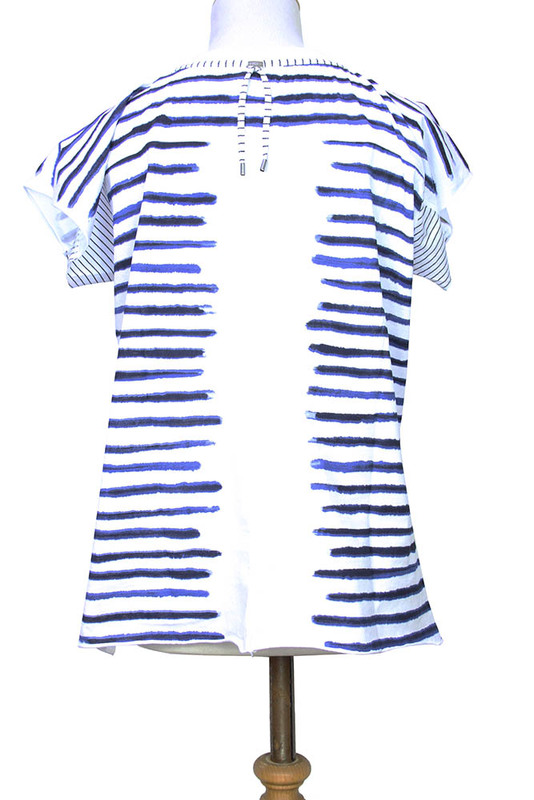 Blue horizontal stripes, with stylised flower print on the front. At the rear the centre is white, except at the yoke, with seam details. Double pinstripe shoelace with metal ends detail below collar under metal High stud. A beautiful Summer jersey t-shirt.